Thank you for choosing Cedar Plains Family Practice for your medical care. We realize that you have many choices for your healthcare needs and we appreciate your choosing us! We see patient by appointment. 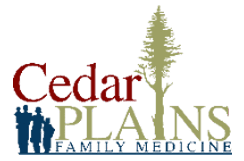 If you have an urgent need and are an existing Cedar Plains Family Medicine patient, we will accommodate you the same day whenever we can. If you are unable to keep a scheduled appointment we ask that you give us a 24 hour notice so that we may offer your time slot to another patient in needed. Multiple missed appointments without notification could result in charges. Patients are responsible for any co-payments, deductibles and non-covered services at the time of visit. For your convenience, we accept cash, checks, debit and credit cards. We participate with most major health insurance plans in the area. We recommend that you contact our office to confirm our participation with your plan. When you need a prescription refilled, please contact your pharmacy. If you have a prescription that has not been previously filled by our office, you may be asked to make an appointment to discuss the refill request (e.g. specialty medications, as needed medications, and controlled substances). All other prescription refills should be requested through your pharmacy. Please allow at least 48 hours to process your request, this does not include weekends or holidays. Please note that, as a general rule, we do not refill medications after regular business hours including weekends.